Play in the best sand volleyball leagues with Meet. Play. Chill.! Sand Volleyball is here for the summer! We've got the best places to play sand volleyball in town. This summer join us at Monaco Park & Lakewood Park! Each league is a 7 week league with a big end of season tournament. You are guaranteed at least 8 MATCHES (7 regular season + at least 1 tournament match) each season. Our matches are a FULL ONE HOUR in length (except where noted otherwise). Finished early? You are more than welcome to keep playing until the next match starts. The 2's and 4's leagues are self-officiated, but monitored. The 6's league includes a paid official at no additional cost. This league will use King of the Beach Volleyballs. Registration for the spring will open soon! 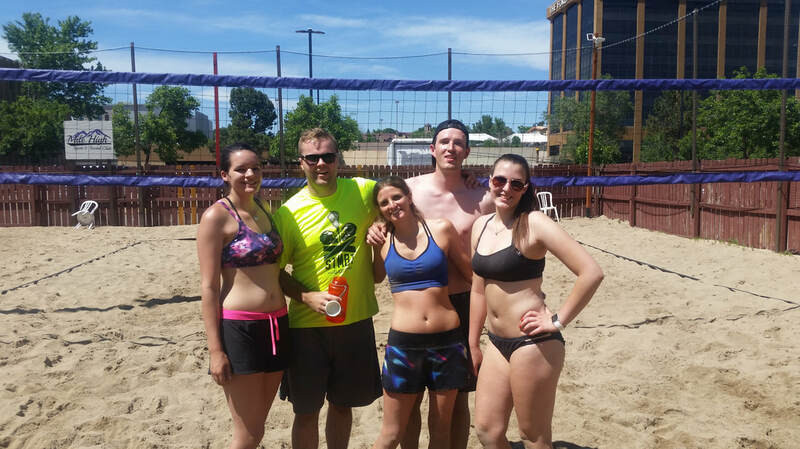 Join our e-mail list now to know about our awesome sand volleyball leagues, tournaments and drop-ins. Don't have a full team? No worries! Register as an individual and we'll get you placed on a team in our AWESOME leagues! Located at this great park just north of downtown at (56th and Monaco), these are great lit sand volleyball courts with plenty of free parking right next to the courts. On the west side of downtown is this great park with FOUR great sand courts! We've got four nice courts located for our leagues. The league runs during the summer and players have access to great mountain views and are allowed to bring in outside beverage and food! Session 3 Registration is now open - join the fun now! Want more information? Visit our registration page here, or give us a call at 303-923-5645! You can also e-mail us at WePlay@MeetPlayChill.com.